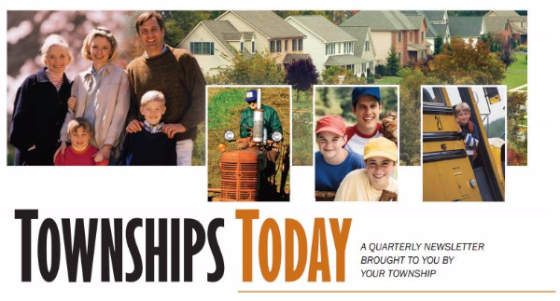 Welcome to the latest issue of Townships Today, a quarterly newsletter designed to help you educate the public about township government and other issues that impact them. Townships Today is written specifically for township residents, and we ask you to share it with them. This quarter’s issue – click on the image at right to view – warns residents about the dangers of radon, a silent and deadly gas linked to lung cancer. Testing is the only way to know for sure if a home is harboring radon so the article offers practical steps to guide homeowners through the process. As a bonus, we’ve also included a short Local Government Week article that encourages residents to volunteer in their township. Also, while PSATS created this newsletter, we want you, our members, to take full credit for the publication, as well as the quarterly articles, if you choose to use them in your own newsletter or post them on your website. To share your comments about Townships Today, contact Editor Jill Ercolino at (717) 763-0930, ext. 125, or jercolino@psats.org.